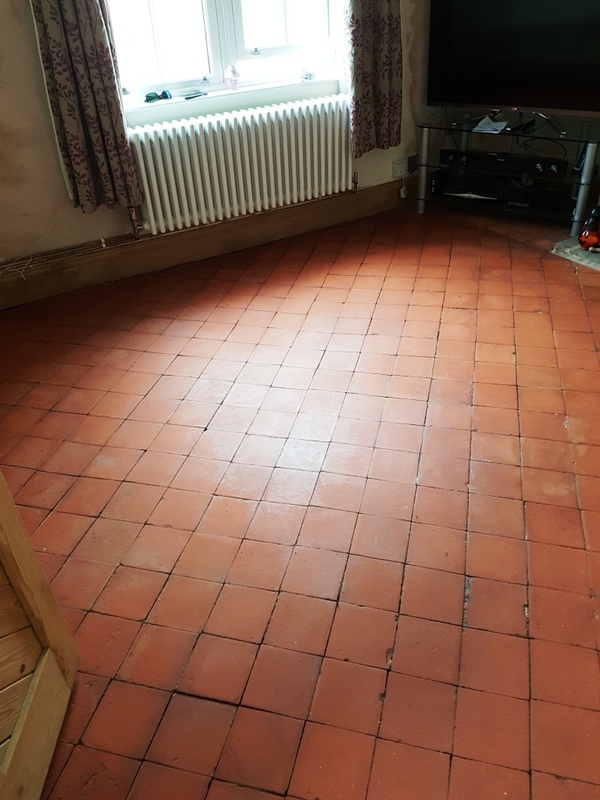 We are very often contacted by customers to restore tiled floors they didn’t even know existed. Usually, the tiles will be hidden away underneath either carpet or, in some cases, linoleum. 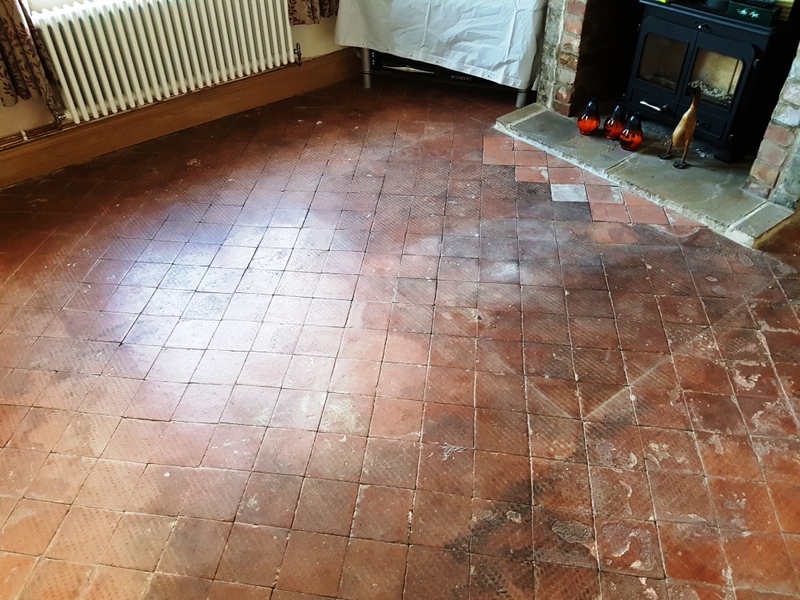 And, once the tiles are discovered, the likelihood is that the property owners want to have them restored to their original condition which is understandable as original features definitely add value to a property. Here’s an example of this sort of work that I recently undertook at a property in the affluent suburb of Hale which is only ten miles from Manchester. The recently discovered floor in question was formed of very nice (but also very dirty) Quarry tiles. The customers had just bought the property and, having pulled up the carpets on the ground floor, were surprised with what they found. 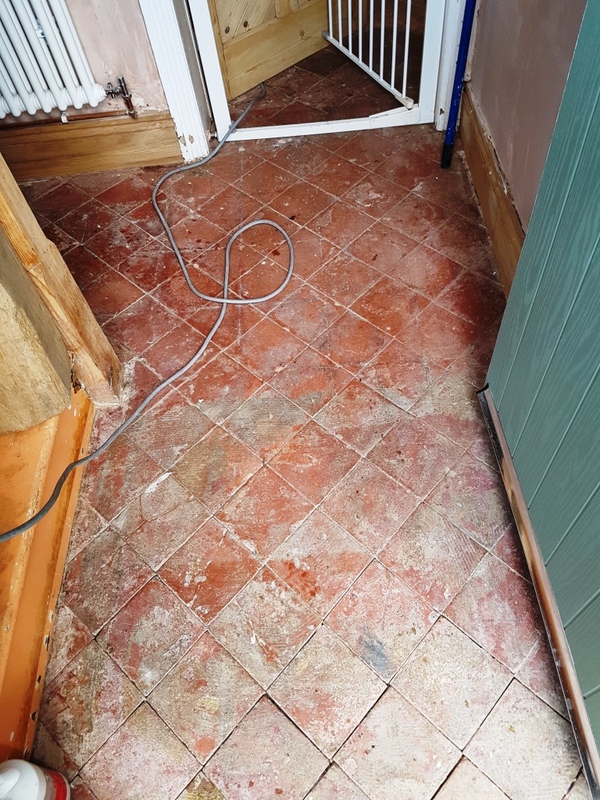 They really wanted to get the floor restored in order to highlight the original character of the property, however, it was very heavily soiled and marked with glue deposits that proved very difficult for them to remove. As a result, they opted to search online for a solution – finding Tile Doctor in the process. In the first instance, I visited the property to conduct a test clean and, with the customers pleased the result, we agreed dates for the full restoration to be carried out. 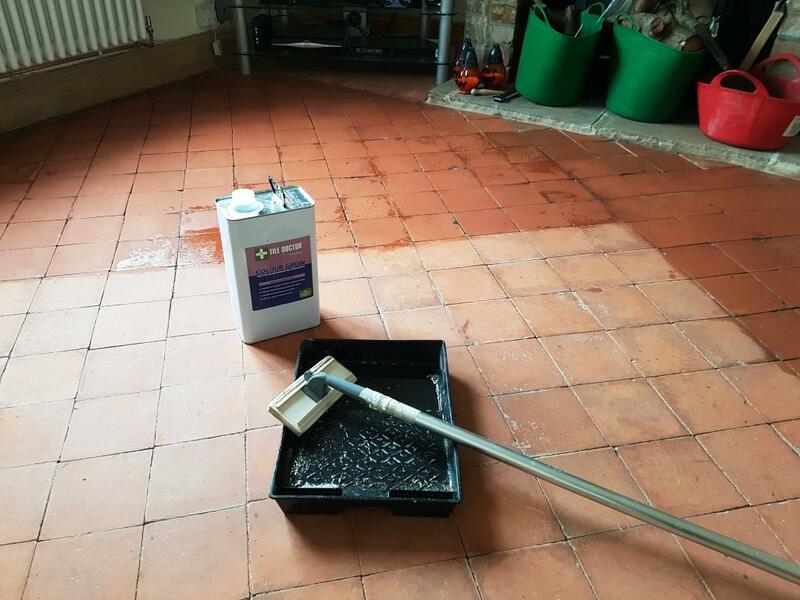 For cleaning the floor I started by using Tile Doctor Remove & Go, a product which is specially designed for removing coatings such as sealers, waxes and adhesives from tile – including the types of glue deposits left upon the removal of carpet. I left the product to dwell on the floor for 10 minutes before scrubbing it in to the tiles with a black scrubbing pad fitted to a rotary machine. Next, I removed the now soiled cleaning solution with my wet vacuum and rinsed the floor several times with water to neutralise it, again followed by extracting the water after every rinse. Overall, the cleaning process was a success, but there were a few problem areas where the adhesive proved particularly difficult to remove. 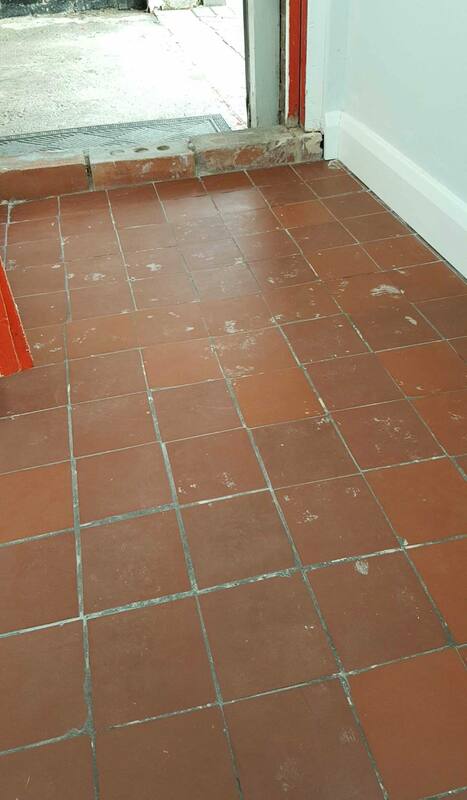 To these areas I applied Tile Doctor NanoTech HBU Remover, which is a heavy build-up remover designed to work where other cleaners won’t. It utilises nano-sized particles to penetrate below tough stains and eliminate them. This was left to work its magic for about half an hour. Following this, I steamed the tiles to soften the adhesive even further and then scrubbed the problem areas with hand held black scrubbing pads. This cleaning combination worked really well to clean the problem areas and all I had to do next was rinse them properly, before leaving the whole floor to dry. I returned to the property after allowing the floor to dry for three full days. Thankfully, I found that there were no damp issues to address, and so I could proceed with sealing without a problem. 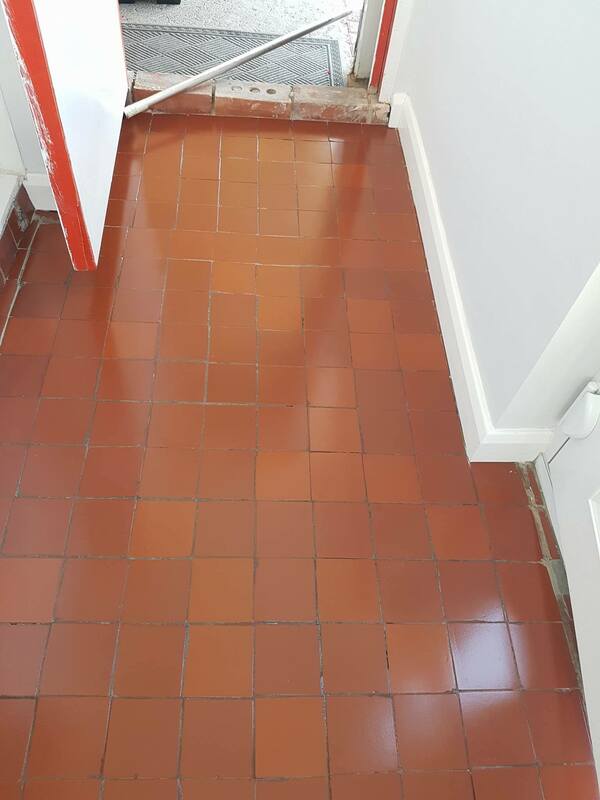 The customers wanted to keep the floor as natural looking as possible, so I opted to use Tile Doctor Colour Grow, our impregnating sealer which soaks into the pores of the tile protecting it from within enhances the colours in the process and leaving a matte finish. I applied several coats before polishing off the excess using cotton cloths. Looking at the before and after photos, I think you can agree that the floor is transformed! Certainly, my customers agreed – the newly restored Quarry floor will be a real asset to the property. 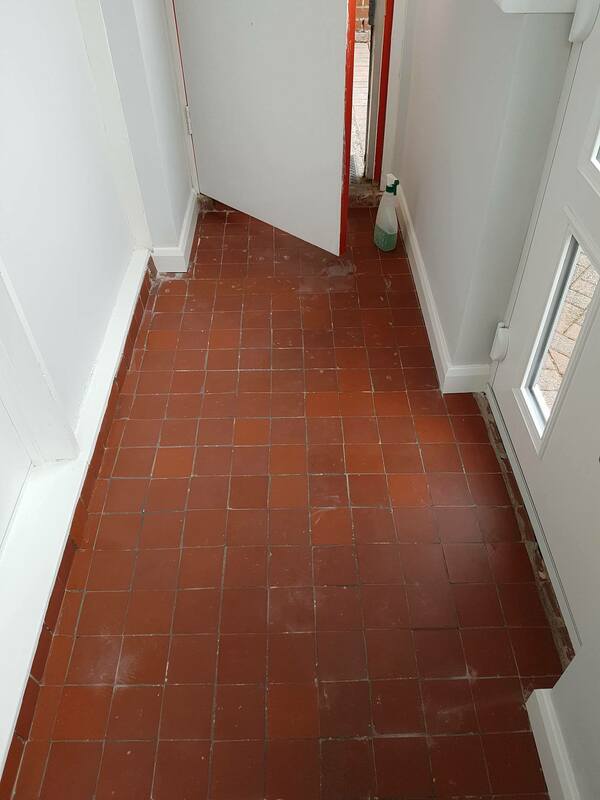 It’s not uncommon for us to hear from customers who have decoration work undertaken, only for the builders to leave plaster and paint stains all over the floor. 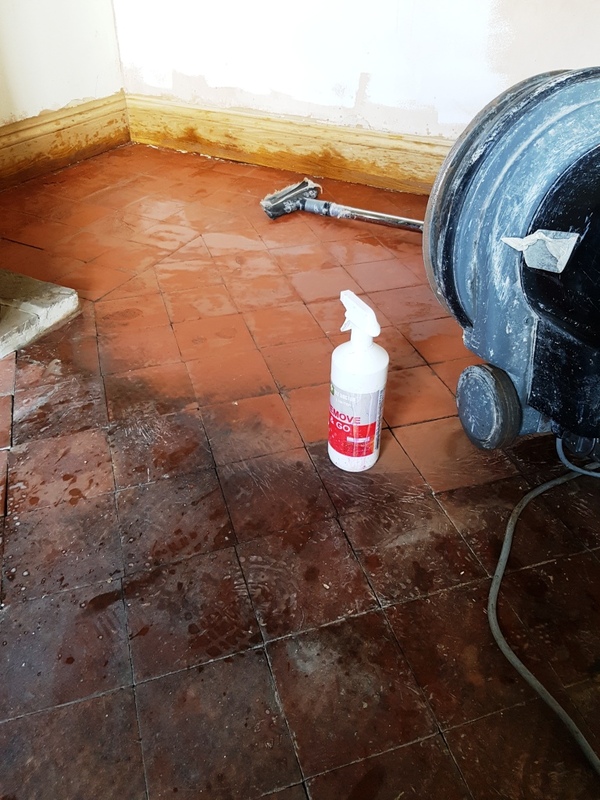 These types of stains can be particularly difficult to remove from tiles – especially if you rely on using everyday, supermarket quality products. 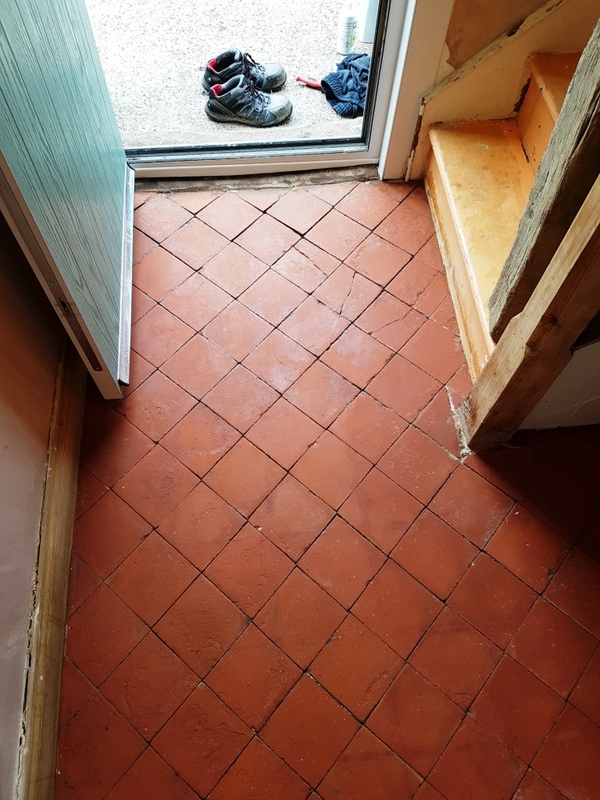 This was a problem for this customer from the town of Middleton, who had just had a new porch built and in the process the Quarry tiled floor had become very noticeably stained. 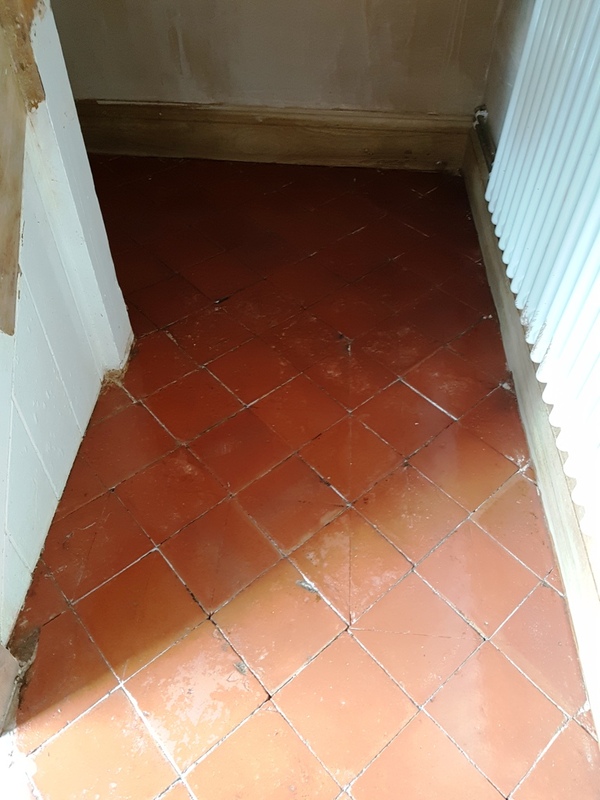 Struggling to deal with the problem herself, the customer found Tile Doctor online and decided to make use of our expertise. 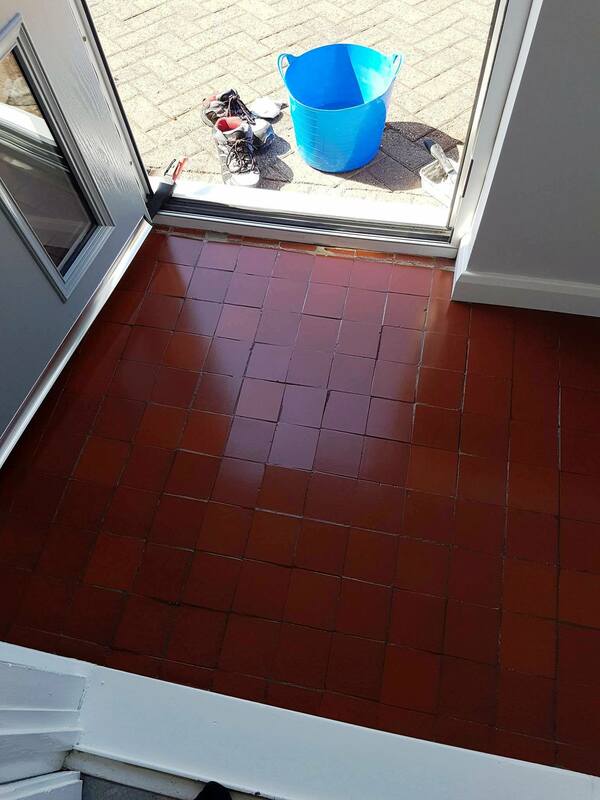 To clean the porch tiles we used a strong dilution of Tile Doctor Pro Clean, our powerful alkaline product designed to remove dirt and stains on natural stone tiles and grout. We evenly applied Pro Clean and left it to dwell for five minutes, allowing it to seep into the tiles. We then agitated the product with a black scrubbing pad fitted to a rotary machine, breaking down the stubborn paint and plaster marks. The resulting slurry was then removed using a wet vacuum, before the floor was rinsed thoroughly to remove any chemicals from the stone. With the tiles looking fresh and clean, we left them to dry completely overnight. We recommend a natural drying period of about 24 hours, although in some circumstances heat guns and turbo dryers can assist in speeding up the process. I returned to the property the next day, starting by using my damp tester to check whether the floor was dry enough to seal. There were some areas that were still damp, but I managed to get them dry quickly with my heat gun. For sealing, I used four coats of Tile Doctor Seal & Go, our water-based blend of acrylic polymers that provides both a stain resistant surface seal and a durable low-sheen finish that compliments the natural stone. The addition of a fresh sealer will make the tiles far easier to keep clean in the future. The customer was very pleased with the overall result. However, she was keen to make sure she could give the tiles the regular maintenance they need, so I left her with a complimentary bottle of Tile Doctor Neutral Tile Cleaner. This gentle, pH-neutral cleaner is perfect for regular maintenance as it reliably removes dirt and stains without damaging the sealer. You can use it to clean all types of tiles, stone and grout.